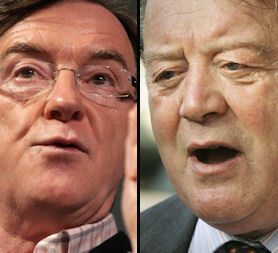 Exclusive: Ken Clarke and Peter Mandelson do battle over the future of post-recession UK in the first "big beast" debate of the unofficial election campaign. In a TV first, the former chancellor and current business secretary clashed on a series of issues - from spending to national debt and the prospect of tax hikes - with Jon Snow at one point being forced to "call a truce". In almost comical scenes, the arch-enemies accused each other of "irrelevance" and "nonsense" as Mandelson insisted that, at root, they were in agreement. Reacting to this morning's 0.1 per cent growth figure, Mr Mandelson said: "Thankfully the economy now is in positive growth, but the economy remains fragile. "The recession is behind us. What's important is locking it in, rather than pulling away government support." The shadow business secretary countered: "We have to turn this into real growth. The problem is it will not grow until we tackle the deficit. "This is a plateau, mainly because of what the Bank of England has done. The fact we've just barely got into growth shows nothing is really happening yet. Unless we tackle the deficit, growth won't grow." Mandelson was confident the true figure would be higher, and warned against the Tories' planned cuts. He said: "When you see the final full figure for the fourth quarter, they will be revised upwards. "The recovery is fragile, therefore we must not kick away the support the government gives, by making sudden and swingeing cuts." He added: "The people who are the real heroes of this recession are the businesses that have made cuts and survived. The economy has emerged more strongly and more intact than was predicted." Clarke disagreed: "That's not true. This is the deepest and longest recession we have ever seen. "I would have started by controlling public spending, I would have tried to get Britain out of mounting debt by now." The business secretary shot back: "Of course we have to pay back debt, nobody is questioning whether to do that - it's how, and when. "The question is when. I much prefer Ken Clarke's view than the Tory central office script. If we're not careful and we make swingeing cuts, we will not be trimming back the branches, we will be cutting the roots of growth." Both men's voices raised a pitch and the pair drew physically closer as the debate progressed. At one point Mr Clarke told his rival: "Peter, for heavens sake. I know you're worried, this is very bad news for you, but for heaven's sake behave yourself." On potential tax hikes, Ken Clarke avoided answering with a straight yes or no, but said higher interest rates and public spending cuts will be necessary under the Tories. Mandelson added: "If we fail on growth, yes it is possible further increases will have to take place." Blog: is this the double-dip? Blog: do Brown, Cameron look daft?